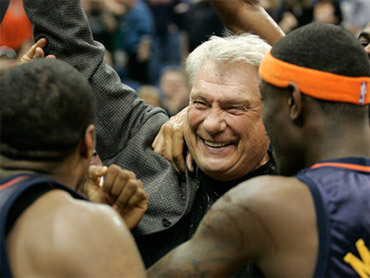 In 31 seasons on the bench, Don Nelson has clashed with players, management and ownership, leading to much debate about the legacy he will leave when he finally walks away. There is no arguing this: ol' Nelly is the NBA's winningest coach. Nelson surpassed Lenny Wilkens on the career list with win No. 1,333 in the Golden State Warriors' 116-107 win over the Minnesota Timberwolves on Wednesday night. "It's just such a neat feeling," Nelson said, his hair soaked with a fizzy concoction of soft drinks and water after a wild celebration in the Warriors locker room. "This is probably why we end up coaching, for moments like this." Nelson's career started in 1976 when he took over the Milwaukee Bucks 19 games into the season. He has also coached in Dallas, New York and with Golden State twice during his colorful career, but has never made it to the NBA finals as a coach. "His style has always been a little unique," Warriors GM Larry Riley said in a statement. "But the fact that it has resulted in over 1,300 wins, the most for a coach in the history of the NBA, certainly cements his legacy as one of the greatest in the business." He won five titles as a player and has been named coach of the year three times, but is the only coach with more than 1,000 career victories not to be inducted into the Hall of Fame - another indicator of the mixed reviews his career has received. "The success he's had, the longevity he's had, it's tough to be a coach in this league and to stick around as long as he has," Timberwolves coach Kurt Rambis said. "To have the success that he's had, the numerous situations he's been in. He's done a great job." Nelson has 13 50-win seasons, third most behind Pat Riley and Phil Jackson. But he has also presided over 10 teams that failed to reach .500 in a year. "He hasn't had a championship yet, so this is kind of like his championship," said Warriors forward Anthony Tolliver, who scored 34 points against the Timberwolves. "We wanted to make it as special as possible." Whether his teams were winning 15 games or 60, they have almost always been entertaining. His trademark "Nelly Ball" style is wide open, often using three guards on the floor at the same time to push the ball up the court, shooting first and asking questions later. Nelson has built a reputation as a "mad scientist," experimenting with lineups and offensive sets to cater to teams that were not always the biggest, strongest or most talented. In his first stint with Golden State in the late 1980s, he employed the famous "Run T-M-C" lineup of guards Tim Hardaway, Mitch Richmond and Chris Mullin in a run-and-gun attacking style. In 2006-07, he led the undersized and eighth-seeded Warriors to a stunning upset of top-seeded Dallas. This year, he has captured the victories record despite a roster that has at one time or another used seven players with experience in the NBA Development League. "I told the team that I loved them dearly, that they were very special to me," Nelson said. "But sometimes they don't play like I want them to." This has been a long season for the Warriors (24-54), who have been ravaged by injuries and are a lock to finish with their fewest wins since 2001-02. But in some ways, this was the perfect team to take Nelson to the top of the record books. "For us to get the record is a big accomplishment for us," rookie Stephen Curry said. "We call it our championship game." It was extra special for Nelson to do it in Minnesota. He has a daughter who lives in the Minneapolis suburb of Minnetonka and had 20 family and friends at the game, including his wife. He also said Wilkens has been in contact with him recently as he neared the mark. "Lenny's been an idol of mine for a long time," he said. Among active coaches, Utah's Jerry Sloan (1,188) and Jackson (1,095) are closest to Nelson on the list. "There's plenty of guys close to that if they want to coach a couple of years," Nelson said. "There's coaches out there that win 50 at a time, 60 at a time. Not like me, winning 20 at a time, it's a little harder."